I am one of the strongest dogs around. When I have five of my friends with me, we can pull a sleigh weighing more than 700 lb (355 kg) for a distance of 50 miles (80 km) in just one day! Jobs like sleigh-pulling are not that easy to come by these days, but I can go to school to learn guarding, because I am very intelligent. Despite my wolf-like appearance, I am affectionate and gentle and very good with children. I like the cool, brisk weather much better than summertime. If I stay inside with you much, I'll need brushing, but my coat doesn't need any special grooming or clipping talents. My preference is to be outside where I can run and exercise, but if you will take me jogging with you every day, I could stand not having a big yard. When fully grown, I am between 23 and 26 inches tall (58.4 to 66 centimeters) and I weigh between 75 and 85 pounds (33.8 to 38.3 kilograms). We have no Alaskan Malamute Breeders listed at this time. 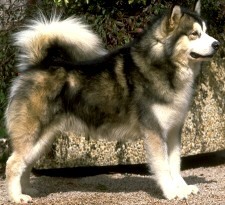 Click here to place your Alaskan Malamute Ad!